The Black Mushroom is a unique item found on the first level of the Cathedral in Act I. It’s one of five of the materials needed to craft a Staff of Herding which is needed to explore the Secret Whimyshire Level. Just like the other materials you won’t be able to buy this on the auction house or trade it with your friends. You will find this in a square shaped room somewhere on the first floor. It looks like a small patch of mushrooms that you can click on and open like a chest. 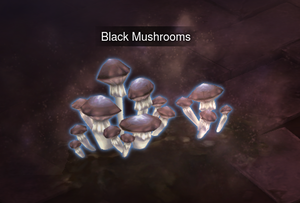 This is one of the five components needed to access the Secret Whimsyshire level in Diablo 3. Just like the other Whimyshire / Staff of Herding items you won’t be able to buy or sell this item on the auction house or trade it with other players. Warning: This could take 10, 20 or even 50 run through to find. Although it’s much more likely it takes you somewhere between 5 and 10 attempts to find it.